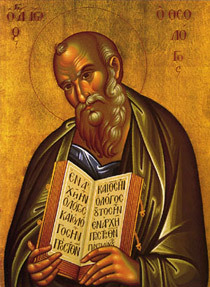 The Gospel of John (literally, According to John; Greek, Κατά Ιωαννην, Kata Iōannēn) is the fourth gospel in the canon of the New Testament, traditionally ascribed to John the Evangelist. Like the three synoptic gospels, it contains an account of some of the actions and sayings of Jesus, but differs from them in ethos and theological emphases. The Gospel appears to have been written with an evangelistic purpose, primarily for Greek-speaking Jews who were not believers: "these are written so that you may come to believe that Jesus is the Messiah, the Son of God, and that through believing you may have life in his name"(John 20:30-31). A second purpose was to counter criticisms or unorthodox beliefs of Jews, John the Baptist's followers, and those who believed Jesus was only spirit and not flesh. Of the four gospels, John presents the highest Christology, describing him as the Logos who is the Arche (a Greek term for "existed from the beginning" or "the ultimate source of all things"), teaching at length about his identity as savior, and declaring him to be God. Compared to the Synoptic Gospels, John focuses on Jesus' mission to bring the Logos ("Word", "Wisdom", "Reason" or "Rationality") to his disciples. Only in John does Jesus talk at length about himself, including a substantial amount of material Jesus shared with the disciples only. Certain elements of the synoptics (such as parables) are not found in John.